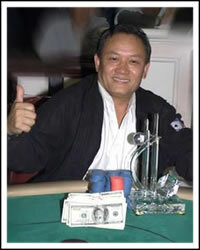 Men Nguyen, is a Vietnamese-American poker player who was born in Vietnam in 1954. In 1978, he fled the communist regime in Vietnam and was granted asylum in the U.S. Men Nguyen became a U.S. citizen in 1986. He began taking trips to Las Vegas in 1984, losing so much that he got called “Money Machine.” Men Nguyen would think about the game afterwards, trying to figure out how to improve. Men Nguyen did improve and started to become a consistent winner. Men Nguyen bought a dry cleaning store and a furniture store with his winnings, but he eventually sold them because he couldn’t stand the job. However, he met many other Vietnamese-Americans through these businesses, and began tutoring some of them, most notably David Pham and Minh Nguyen. He earned his nickname of “The Master” from one of his students in 1991. Men Nguyen unfortunately has a bad reputation in the poker world. He has been known to cheat many times, and has been caught with tournament chips from around the world. Men Nguyen has left scars of hatred in reputable players such as Justin Bonomo, to the point where a pool of players are out to purposefully slow-roll Men. In fact, Justin Bonomo had done this with pocket aces at one point, but had his aces cracked after calling Men’s all in pre flop raise. Men Nguyen has had a very successful poker career. He has won more than 75 poker tournaments, seven of those wins coming from the World Series of Poker. He won one WSOP bracelet in 1992, two in 1995, one in 1996, two in 2003, and one in 2010. He has won CardPlayer Magazine’s Player of the Year Award four times, in 1997, 2001, 2003, and 2005. As of January 2012, Men “The Master” had won nearly $10.2 million, $3.1 million from the WSOP alone. In early November, 2011, the online poker site “Game Face” added Men as one of their sponsored pros, and are using his likeness to market their gaming product. Men Nguyen currently lives in Bell Gardens, California. He is married with eight children. An interesting fact about his family is that he has three daughters with the same birthday, December 22. They were all born exactly four years apart.